This second edition of the popular anthology is an accessible introduction to 20th century poetry on the page and in the air. 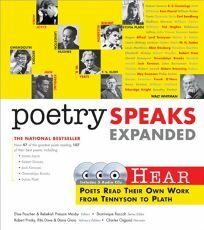 Forty-seven poets-beginning with Tennyson, moving through Eliot, Kerouac and Bishop, among many others, and ending on Plath-are represented in this book and CD package. Attesting to the fact that poetry remains a spoken art form, this book may convince readers that well-chosen words gain vitality when heard aloud, as Allen Ginsberg's incantatory rendering of ""Howl"" proves. William Carlos Williams' ""The Red Wheelbarrow,"" in the poet's voice, takes on a playful singsong quality. Gwendolyn Brooks, reading ""We Real Cool,"" affects her subjects' swagger and attitude, shifting to solemnity for the grave final line: ""we die soon."" The book also includes useful biographical information and a literary essay on each writer by contemporary poets, who locate the poets in historical context: Anne Stevenson, for instance, comments on Plath and Paul Muldoon on James Joyce, by whom this edition also contains a previously unreleased recording of the ""Anna Livia Plurabelle"" section of Finnegan's Wake. Reluctant poetry readers may find themselves drawn to the printed page by the spoken work, and poetry fans are likely to find much to love here.